The choice of applicable procedures suitable for numerical dating and calendar chronology of finds proving the presence of fossil men or early hominids is influenced to a high degree by the characteristics of the fossiliferous deposits. This means different composition of preserved material requires the application of different methods. Consequently, one must accept that there are differences regarding precision and range of dating. As a general rule, the tenet may be assumed that a short range is the inevitable consequence of precise high-time resolution and vice versa. Consequently and independent of the datable material, the older the finds are, the more imprecise is the numerical dating. This aspect is comparable with the optical perspective where the perceptibility of objects decreases with increasing distance. But this is only one aspect of geochronometric perspective. Another aspect is related to the dated material. Fossil remains of men from historical times and in addition from the last millennia can frequently be dated directly, e.g., by using the radiocarbon method. Fossil remains from the Middle Pleistocene, i.e., finds with an age of a few or some hundreds of thousands of years, are not datable directly, but as a rule the fossiliferous deposits may be subjected to numerical dating, e.g., by means of uranium series in the case of travertine deposits or by application of luminescence procedures in the case of loessic deposits. A larger age characterizes early stages of hominid evolution as evidenced by the occurrence of australopithecines. Such discoveries can be dated using only a few methods, e.g., the potassium-argon method (40K/40Ar), and as a result merely rocks and loose deposits of volcanic origin can be considered. This means layers of lava rocks and tephras can be dated at sites of fossil hominid remains, where such layers are included in the stratigraphic sequence. Thus, the object of dating is not fossiliferous deposits but distinct layers in the sequence that includes fossiliferous deposits. 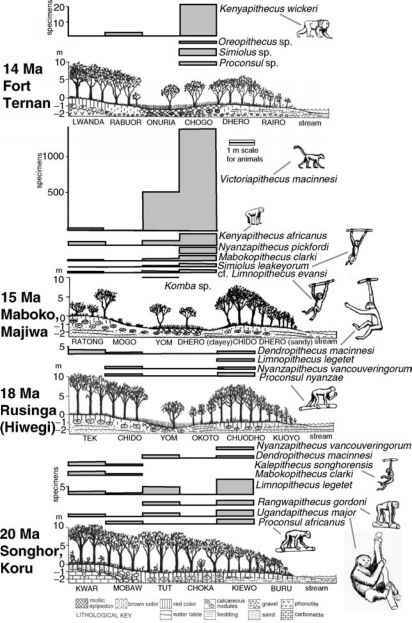 Ergo, the chronological investigation is restricted to time-marks in the local stratigraphy of the respective site (cp, e.g., Fitch and Miller 1976; Ullrich 1983: fig. 3).